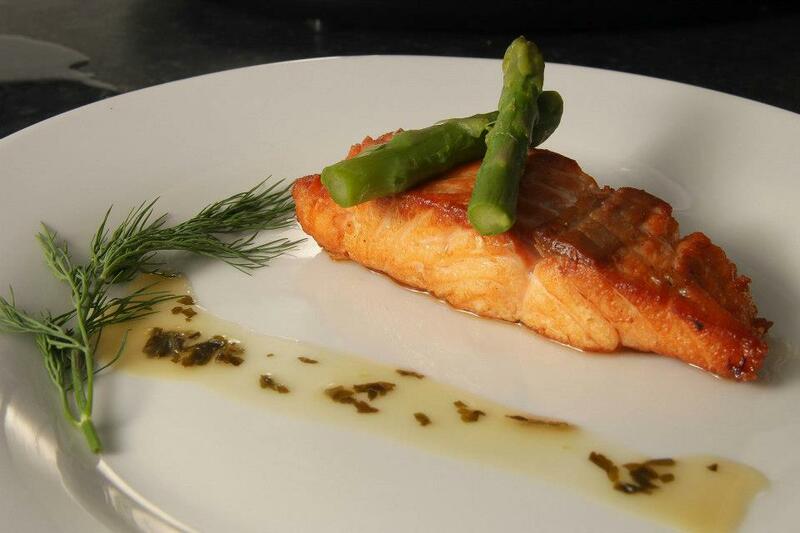 The above is Asian Style Wild Alaskan Salmon, a dish adapted from Jamie Oliver’s recipe of Asian Style Salmon. Like typical Southeast-Asian cuisine, this dish derives strong flavours from garlic, shallots and ginger. The chilli and lime enhance the flavours further and give it a more refreshing taste as well! A friend of mine recently commented that TummyTroll‘s recipes are rather big on salmon… I double checked and she seems right! Subconsciously we’d been gravitating towards salmon for our dosage of the sea. How not to, when there is an abundance of fresh fine salmon from Scotland a few hours up north? 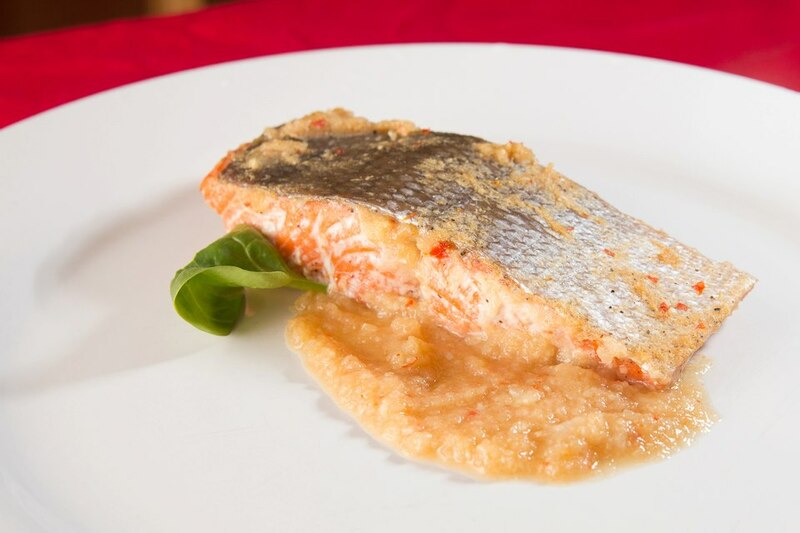 Pals of mine would know that I’m not a big fan of fish in general, but Scottish salmon has proven to be a keeper in my books – Firm, succulent flesh with a delicate sweet taste. Voila. Edit: Here is a picture of the Swedish wild garlic. This is the dried variety. It’s not garlic per se – More of a variety of long-leaf chives. 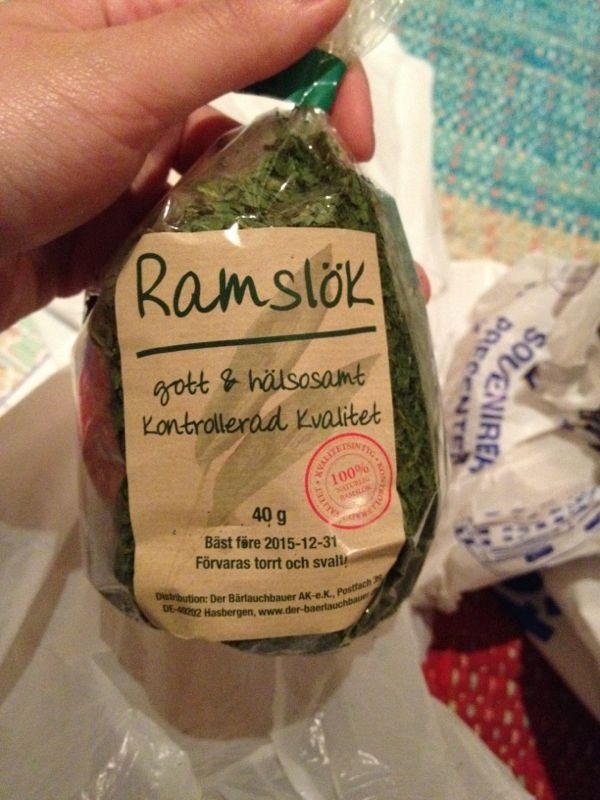 Also known as ramsons! Hello readers! Thousand apologies for the unannounced one week hiatus at TummyTroll. It’s (finally) summer and the TummyTrollers have been trigger-happy whizzing to exotic locales travelling to our hearts’ content! And of course, tasting the best local cuisine from everywhere. Food travelogues should be coming up soon – Stay tuned! I’d been nursing a craving for Japanese cuisine. 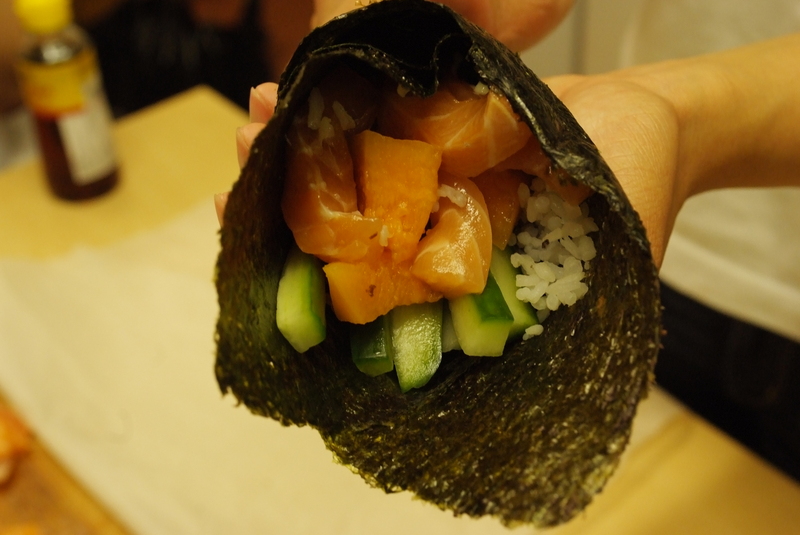 Sashimi in particular, hence the inspiration for a sushi wrap with raw salmon. To be honest I’m not too clear about the exact terminology for this wrap – I’d heard people calling it a California wrap, California roll (but this doesn’t seem quite right) amongst other terms… Nevertheless, it’s a quick and tasty option for a bento packed lunch. Store it in a box suitable for chilled food – Lest the salmon turns bad at room temperature! I replaced avocado with rock melon for an interesting twist on the classic sushi wrap – And what a refreshing change it became! It’s really cheap – Canned tuna, cheese, sweetcorn kernels (frozen ones are infinitely cheaper and last forever), pasta… It is this simple! Helps us save up more pennies for that big trip coming up in Summer! It’s fast and almost effortless. Assembling a few ingredients, boiling pasta, dumping it into the oven – How long can this take? And leftovers can be easily kept in the fridge for your next meals. 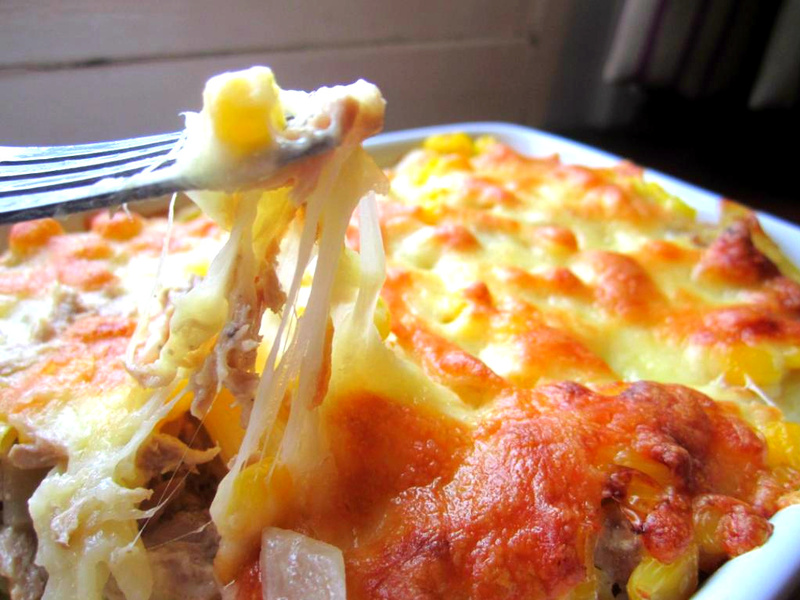 Find out how I make a Tuna & Sweetcorn Cheesy Pasta Bake, all in a few steps! We had to try something different this time round. So this time we tried something a little more elaborate – how about puff pastry? 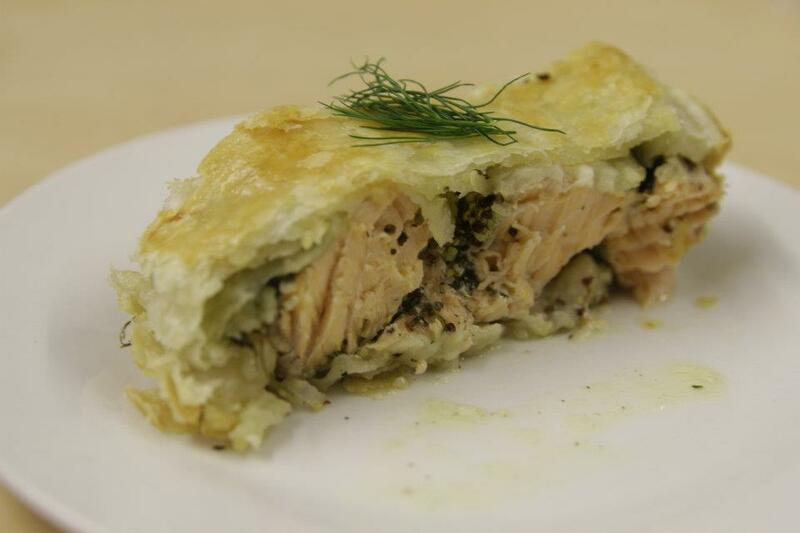 This dish is ever so simple, and yet will impress any of your envious hall mates who can smell the aroma of the fish and pastry diffusing into the corridors. It’s a classy dish infusing the tastes of mustard, dill and basil – and the best part of all? You can do it easily in 15 minutes! We trust that you need no more persuasion to make this dish. We made do with store bought pastry since this was our first attempt at making a pastry dish – but you can try making your own puff pastry as well! We will… when we have devoured enough of this dish.